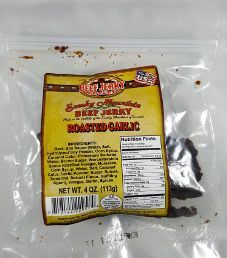 This BJO Smoky Mountain brand is distributed under the name of The Beef Jerky Outlet Franchise, Inc., who are located in Kodak, Tennessee, near the Smoky Mountains. The owners, Rick Kromer and Randy Giandonato, established this Tinton Falls BJO store in November 2016. There are currently over 100 Beef Jerky Outlet stores located across the USA, where free samples of jerky are available. The Beef Jerky Outlet opened up their first store in 2010. 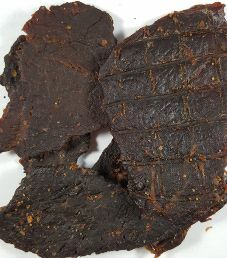 A wide variety of jerky is available for sale, and a 100% grass-fed beef jerky line was launched earlier this year. The liquid marinade consists of a poor soy sauce, a fair Worcestershire sauce, water, and healthy vinegar. It is disappointing that the soy sauce uses the highly processed flavor enhancer hydrolyzed soy protein. Also not good is that cheap, processed corn syrup is used in the soy sauce. Garlic belongs to the allium family. Interestingly enough, garlic will aid people differently based on whatever their personal needs are. The sugar level is great at less than 1 gram of sugar per 28 grams of jerky. The salt level is very high at 600mg of salt per 28 grams of jerky. Our preference is 350mg of salt or less per 28 grams of jerky. Keep in mind that this nutrition facts table is not trustworthy, as the nutrition facts table does not appear to change for each flavor. This jerky does qualify to have no sodium nitrite, or any other similar unhealthy preservatives. Instead, the main preservative used is salt. Vinegar to a lesser degree also acts as a preservative. This jerky does not qualify to be MSG free because the unhealthy flavor enhancer hydrolyzed soy protein is used. 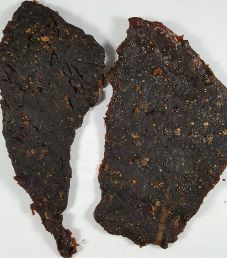 These strips of jerky are mostly large in size, and sliced borderline thick. The texture is fairly dry, and does require some effort to chew. There are some visible signs of fat, and handling this jerky leaves no oily residue on your fingers. The first flavor detected is a good level of garlic, which does taste as if the garlic were roasted. 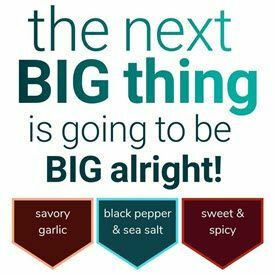 Mixed in are moderate levels of black pepper and salt. The onion is at a light level, which complements the garlic well. With no sweetness present, there is plenty of natural beef flavor as advertised. A good ratio of soy and Worcestershire sauce blends in well. Overall, this flavor very much delivers on both the garlic and natural beef flavor. A 4 ounce/113 gram bag sells online for $9.99. That works out to $2.50 an ounce, which rates as an average price. If you purchase three bags in their store, the price is reduced to $25. Any garlic lovers out there will no doubt enjoy this flavor. This resealable, clear plastic bag has a label affixed to the front, and nothing on the back. The Beef Jerky Outlet logo has bull horns above their name. Their slogan is “Made in the foothills of the Smoky Mountains of Tennessee”. Facts printed on this bag are “Made in USA” and “For Franchise Opportunities: www.BeefJerkyOutlet.com”. The only bag categories missing are a soy allergen alert, and no blurb is printed about the jerky or flavor.